Many times small businesses are perceived as having or being at a disadvantage over larger brands. Sadly, due to the challenges that many small business owners face from cash flow, funding shortfalls, marketing, fewer staff and resources, some entrepreneurs might even believe this perception to be true. 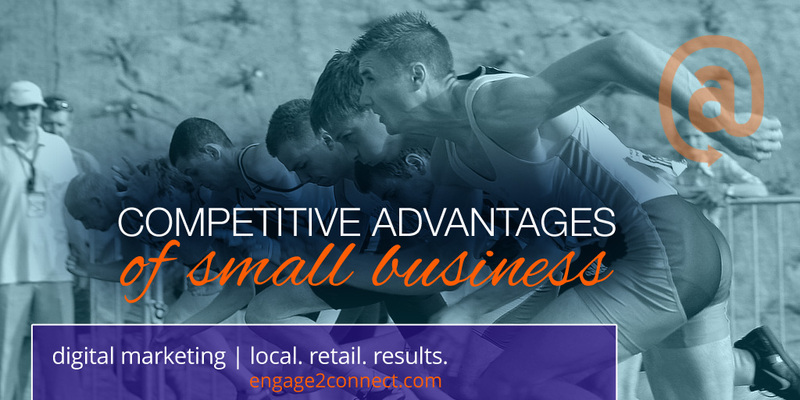 But did you know that small business has several unique competitive advantages over big brands? It’s true! Though small businesses are sometimes seen as simply passive organizations that are hamstrung by their size in our increasingly global and digital branded economy, some of the most successful small businesses use their size to their advantage and overcome the challenges of the big box world. A recent study published by the American Institute for Economic Research actually details these small business advantages that defines success for the local business owner. During the study, small business owners that have succeeded in spite of competition from larger firms were interviewed. The businesses involved in the study included retail, professional services, and manufacturing firms across diverse industries. There were many similarities that became clear when asked about their advantages of being a small business. Following is the breakdown of the competitive advantages uncovered through the study of being a small business that competes with larger brands and big box retailers. Many larger brands are able to utilize purchase power to gain a substantial advantage in the marketplace by both acquiring product at a lower price and then being able to sell those products for less, yet at a similar gross margin. Big retailers tend to centralize their human resources, warehousing and purchasing in this manner that standardizes what they purchase across hundreds or even thousands of stores. While this practice is highly efficient, it does not allow for ultimate diversity of products offered, selection or a focus on niche or quality products. Instead big brands focus on the largest product groups which offer the biggest volume opportunities, as they forego larger selections and niches that cater to smaller populations. Small businesses that don’t try to compete with the purchasing power of the major retail brands and instead focus on unique product offerings tend to fare well. Competing in areas where larger brands are not focusing provides a distinct advantage that allows the local small business to win. Providing products that are of much higher quality, offer unique selection and fit a niche will give your small business the advantage you need. In a small business, people are what make the difference. Think about it… You rarely make a deep connection with the store manager of a national chain retail brand. You rarely build any kind of meaningful relationship with a checker at Wal-Mart and you certainly don’t get to know the CEO or top executives of any of the big box stores that are active within the U.S. today. What you DO have is a much more personal environment that removes the insulation between you the business owner and your customers. You and your staff have the ability to transform the business relationship with your customers from one that only involves money and sales, to one that makes real human and lasting connections. Remember that people hang around people like them, relate to people like them and buy from people they know and like. Your small business staff should be leveraging this incredible competitive advantage, just as the other successful small business do within this study. Use face to face contact as well as interactions online to build relationships with your customers and prospects. Make them feel like they are part of your family and build a culture within your small business that makes that a priority. Your biggest competitors are able to put standardized processes and chain of command points that make for an efficient machine that can be replicated nationally. They do not have the ability to react quickly, make decisions and be responsive in non-standard situations. This is a competitive advantage successful small businesses exploit. Go the extra mile for your customers and be sure to understand their special needs and situations that you can adapt to. Respond quickly and offer solutions wherever you know your big competitors either can’t or won’t. Your knowledge of people, local conditions and the special circumstances that are related to your local area, market or niche is an invaluable advantage to your local business. Use this knowledge you have through experience, close attention and relationships with your local customers to make advantageous decisions about product selection, marketing, and other strategic factors within your small business. Finally, your small business can rapidly and easily innovate where your larger national competitors cannot. Don’t be afraid to use some of these other advantages to create new methods, offerings and processes that give your local customers innovative products, solutions and value. Be nimble and innovative in what you do for your customers beyond the products and services you sell. As you can see, there are many distinct advantages that a small business has over its larger competitors. Rather than trying to compete against big brands with what they do extremely well, look to develop these and other advantages to create value and attraction like never before. As you begin to use these advantages and start seeing them resonate with your customers and prospects, refine the message behind what makes you unique and incorporate it into all of your multi-channel digital marketing tactics to expand your customer base. As more people hear about your business value, then experience it first hand by doing business with you, word of mouth and social media praises will amplify your results!